Begin by scrambling your eggs with freshly grated Parmesan. Set aside. Pour a glug or two of olive oil into a large, deep skillet or wok. Heat over medium-high, then add scallions. Saute for a couple of minutes, until just softened. Pour in the cooked pasta. Stir until heated through. Pour in egg & cheese mixture and a couple pinches of salt. Add the herbs and crushed red chiles to taste. Stir & scramble the mixture regularly until eggs are cooked through. 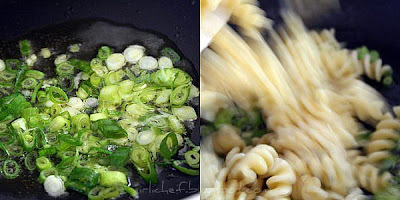 They will fill the grooves of a pasta like fusilli really well. This serves 2 people. Generously! This is also my entry for this weeks Presto Pasta Nights #130 hosted by Rachel of The Crispy Cook. Check out the roundup at the end of the week. Hey, I gotta half box of pasta in the cupboard. This sounds perfect! What a great idea, like fried rice.. only noodlier! I just had Muffets for breakie.. I would much rather have had this! Ooh, sounds lovely! An aunt of mine used to bake spaghetti with egg and tomatoes so that when it was cooked you could cut slices of it! So strange but delish! Yummmmmm...will definatley give this a try, thanks. Does this mean I get to eat pasta for breakfast, lunch, AND dinner?!?!? I think so. And I love your longer posts, your entries are so much fun to read. So never apologize for them! Looks great! 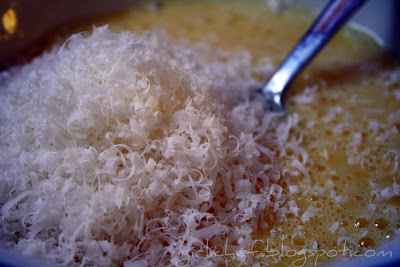 Anything with eggs and parmesan cheese has to taste good! I totally am going to make this (I'm trying to empty out my pantry before a move and have lots of pasta I need to use.) Thanks for the idea! 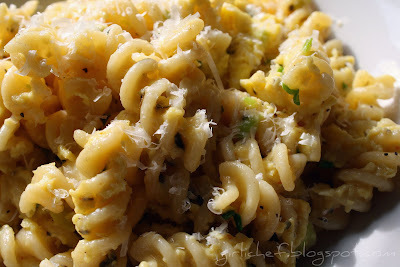 This reminds me of carbonara and I lOVE carbonara...Thanks for sharing another amazing recipe!!! I cant wait to try this too! This reminds me of egg fried rice. What a great idea!! !Sounds delicious. ooh! now I have a good idea for leftover pasta besides eating it right out of the container :) mmm I'm a pasta addict, so this is perfect! Thanks! Ok...this isn't fair. I had to go to work early this morning and didn't have time for breakfast and I'm STARVING!!! How about a little sausage in there too? YUM!!! Yum! I made Jenn's recipe the other day too! Love it! YUM! I hate breakfast food, but this is something I can get behind! Awesome! Sounds like a very interesting combination, and a great use for leftover pasta! I like it! This is so unique! I love that you made it for breakfast. Three times a charm - I guess I need to try it - ASAP. I think I've started something here. LOL. It's super delicious, isn't it???? I love the addition of the red chiles. A little heat. Yum!! I can't tell you how good this looks to me right now...! 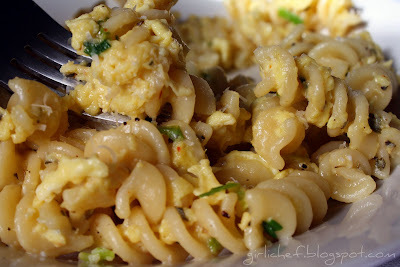 I have made, for years, noodles and eggs with onions and whatever the moment dictates. I never thought of using a different shape pasta. Well, now I can do just that. You are filling up my, "to do" list. Where do you get the time? Girlichef, I love this. I especially love this because I just made some pasta salad (which I will post about tomorrow) and had some cooked pasta left over. With my honey working until 8 pm, sometimes I can't wait for him to get home to eat. This would make a perfect "brunch" for me. Thanks for the great recipe. I like that you scrambled in parmesan in the eggs! 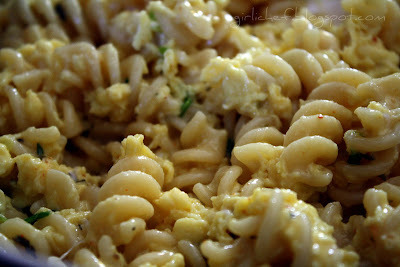 I love pasta with scrambled eggs!! Jenn...I believe you may be right! I love your version with the spiral pasta. I also love all that curly grated parm! oh! I've never seen this done before and I love it! I like Joanne's idea. Pasta for breakfast, lunch and dinner! Love it. I must have missed this post from Jenn's blog. Because my eyes are THIS big and I totally am making htis soon! 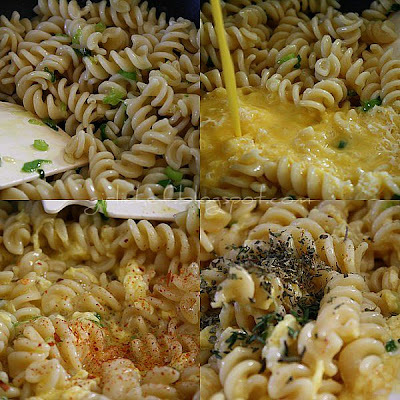 I wouldn't have thought of pasta and eggs together in a million years, but your photos make it look VERY tempting. Thanks for sharing. Great idea for that leftover plain pasta I never know what to do with! I really need to try this too, looks really good! What a good spin on pasta. 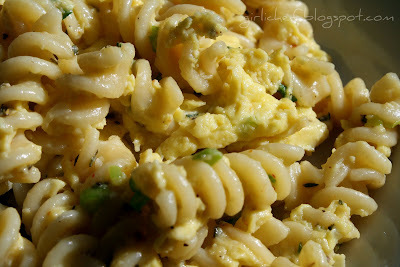 I love eggs and pasta together (ala carbonara) so I might just have to give this a shot soon. YUM. I am SOOOOO making this. I bet I could get away with whole wheat pasta in this and still have such a great consistency with the eggs and cheese-thanks!! A nice combo of delicious chow! Thanks for the advice on the Flicker and all computer applications. I'm getting there! These sounds so flavorful! I love the ingredients you've used here. The tutorial is terrific. mmm, this looks so filling and delicious. what a fun breakfast idea! Yum! I have been craving eggs like there's no tomorrow. This looks perfect! What a delicious and comforting pasta Heather. Your photos are always great, so your hard work pays off. I like the idea of this recipe -- I'm sure I always have pasta and eggs kicking around. Instant dinner. What a unique dish, I would have never thought to combine eggs with pasta, but I bet it's delicious! Oh yum! I make frittatas to use up leftover pasta now and then so I know just how good this is! I've definitely used left over pasta in frittatas, but this is absolutely BRILLIANT!!! !